You step onto the pitch for the first time. Light arcs over the stadium wall as your team mates follow behind you. As you warm up, you realise there's something different about the other players. Their movements are more lifelike, their features more realistic, and even the way the ball moves seems... well, it seems more like a ball. Welcome to next-gen gaming in FIFA 14 for the Xbox One and PS4. At TechRadar, we've disected the specs of the next-gen of consoles, but those numbers are ultimately meaningless without the games. So we spoke to developers on four of the hottest next-gen titles to find out what goes into making a game worthy of the newest hardware, and why playing them will be a whole new experience. One of the biggest impacts will be on artificial intelligence, with computer-controlled behaviour becoming so smart that developers say you'll have trouble telling the difference from human players. 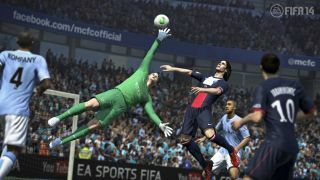 "Now you can use body position to win back the ball and not be completely reliant on using the tackle button"
Nick Channon, Producer on FIFA 14, explains that in previous versions of the games, the team has always made scripted animations that react to players on the field. The eight-core architecture of PS4 and Xbox One has allowed the team at EA Sports to create a predictive model that uses your position to anticipate your next move. The opposing player can then react on the field, even avoiding what would normally have been a tackle. Channon say these changes are "helping to dramatically change the physical interactions between players, meaning that now you can use body position to win back the ball and not be completely reliant on using the tackle button." FIFA - no shirker in the lifelike stakes - is going to feel even closer to the real thing. And yes, that includes the ball. Due to the increase in RAM size to 8GB for both the Xbox One and PlayStation 4, the developers decided to give many additional options for ball animations, including new looks for crosses, longer through-balls, short touch passes and even finesse headers. Channon says those improvements would not have been possible without the new CPU and RAM size. "Just one eye of one character in Ryse requires more animations than an entire character on a previous gen console"
But the increase in RAM only makes those animations possible. To create them, developers are making increasing use of motion capture to bring characters to life. For the bloody classical fighter Ryse: Son of Rome (an Xbox One exclusive), developer Crytek turned to facial animation techniques. These were used with mixed success in Rockstar's 2011 LA Noire, but Ryse marks the first time they've been used not just for cutscenes but for actual gameplay. The amount of information needed is immense: Michael Kelleher, Senior Cinematics Manager, tells us just one eye of one character in Ryse requires more animations than an entire character on a previous gen console. According to the developers, Ryse's main character, Marius, has facial expressions that match or exceed what you would see in an animated or pre-rendered character in a feature film. This adds a sense that the character is alive, thinking, and reacting to the game environment. To capture all this detail, dozens of cameras were used in a closed studio. With 12 actors and 50 crew, the team filmed 49 scenes over 18 days (42 of which were actually used), including hand-to-hand combat and reactions to pivotal points in the game. More than any other game, Ryse points the way for the look of next-gen games in the coming years. "With the new Xbox One we can now increase the fidelity of character rigs [how a character looks] and thus drastically improving the quality of animation and performance," says Kelleher. "The team on Forza insisted that the hardware support effects like motion blur, depth of field, and lens flare"
Not only is there more detail, but it's also going to look better than ever. In games for the previous generation, there might be a cinematic that the team rendered at 30 minutes per frame, much like a high-end Hollywood film. But to make Ryse, the team renders in real-time at 30 frames per second for the same quality. "Next generation gameplay looks better than most of the cinematics from PS3 and Xbox 360"
You can see the result in the game, with a lush, movie-worthy look and fluid motion. Choppy, low quality animations are out. If anything, Ryse's gameplay looks better than most of the cinematics from the previous generation. To make sure games could run at the higher 1080p/60-frames, developers have had to adapt hardware support for features in the games. With next-gen racer Forza 5, for example, the team at Turn 10 have been working with the Xbox One platform team from early on. They insisted that the hardware support effects like motion blur, depth of field, and lens flare. This emphasis on hardware-software interchange makes possible some dazzling effects. One example of this: as you drive, you can see a reflection of the dashboard in the windshield of the car, something brand new for the series. "Through features like our new physically based materials system, every surface in the game accurately reflects and refracts light just as it does in real life, resulting in a game that's more beautiful and more lifelike than ever before," says Turn 10 Director Dan Greenawalt.